The two trees in the garden of Eden are mirrors of each other. On the one hand, there is the tree of knowledge between good and evil, which makes one wise but also makes one mortal, and, on the other hand, the tree of life, which makes one immortal, never to taste of death. In the Pearl of Great Price, in the book of Moses chapter 5, we learn of Adam and Eve’s circumstances after they have left the Garden of Eden. They begin to till the ground and to have children together. They pray to the Lord, but cannot walk and talk with Him anymore because “they were shut out from his presence.” (Moses 5:1-4) But that does not mean that Adam and Eve had been forsaken, far from it. The angel is speaking of the sacrifice of Jesus Christ, firstly, the atonement in the Garden of Gethsemane (see Matthew 26:36-44, Mark 14:32-41 and Doctrine and Covenants 19:16-19), where he took upon himself all our sins, sorrows, illnesses and every little horrible thing that can happen to us, and secondly, the crucifixion on the cross of Calvary (see Matthew 27-35-45, Mark 15:24-33, Luke 23:32-43 and John 19:18-22), where he died so that we might live. He broke the bands of death and rose from the dead so, after a period of time, we too can live again. 10 And in that day Adam blessed God and was filled, and began to prophesy concerning all the families of the earth, saying: Blessed be the name of God, for because of my transgression my eyes are opened, and in this life I shall have joy, and again in the flesh I shall see God. If the fall of Adam and Eve was such a terrible and evil thing, then surely one can assume that Adam and Eve would not be praising God? Surely they would be cursing his name not blessing it? Why would they be joyful if what they did was inherently wrong? If a person’s eyes have been opened, they have come to a knowledge, an awareness of a truth or a topic. Adam recognises that partaking of the fruit was necessary for him, his wife and his children to be able to have the opportunity to live with God again. Eve recognises that they could not have had children if they never partook of the fruit. They would never have known good from evil. They could never be redeemed and never have Eternal life. Adam and Eve would never have been able to feel joy, for they would never have known sorrow. Adam and Eve told their children what they had learned. They are responsible for their children and as such, they are responsible for the physical, intellectual, emotional and spiritual nurturing of them. Adam and Eve are the ultimate role models for what a couple should be like. Woman conceives, bears and teaches her children and man works for his living to provide for his family. Their roles are different, but they are equal partners in God’s plan. It was through woman that we became mortal. Eve partook of the fruit of the tree of knowledge. It was through man that we will become immortal. Jesus Christ died on the cross at Calvary and then, three days later, he rose from the dead, never to die again. Through his death, we too will become immortal beings after we die. 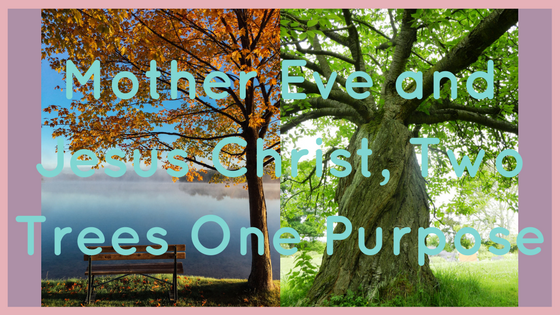 What Eve did, and then Adam, benefited all of us. What Jesus did benefited all of us. We could and would not exist as flesh and blood if it were not for the great sacrifice of Eve and we could not hope to attain immortality and the possibility of exaltation and becoming Gods and Goddesses, provided we live worthily and do all that God commands, if it were not for the great sacrifice of Jesus Christ. So, you see, we need both man and woman to, firstly exist as flesh and blood bodies, and secondly to gain immortality and Eternal Life. Man and woman are equals. We have different biology and different psychology, but it is in the union of these differences, the co-existence of our hearts, minds and souls, that true balance can occur. It is only in this co-existence, and fulfilling certain pre-requisites that we can achieve our highest potential.